I don’t know what the next move is for Blake Shelton. Maybe we’ll see another single from his album. That’s kind of what I’m guessing this song might turn into. But he could also go with a new song from an upcoming album. It’s always hard to tell during these transition periods. I thought we could look at this one anyway. Blake put out an animated video for this one. So it’s at least getting a little attention. And it’s got some classic Blake Shelton tongue-in-cheek to it. It’s fun. It’s silly. But it’s also catchy and should make you smile. So the hook here has a little innuendo, but it works out just fine. And it should be fine for the kids to sing along to this one in the car. The theme throughout is that life is a little better when you’re doing activities to country songs. Hanging with your buddies shooting the bull. Dancing with your significant other. The main hook and chorus are repeated throughout the song. That will surely drive things home, but you can’t help singing along when you hear it. In fact, it’s one of those that I think gets better the more times you hear it. And it sounds like Blake included the Oak Ridge Boys on harmonies for this one. That’s obviously a great choice. 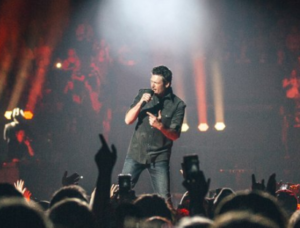 Blake is definitely a fan of traditional country and he doesn’t get enough credit for that.